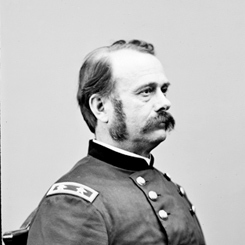 Image courtesy of Library of Congress A one-term Representative from Kentucky, Lovell Rousseau served in the Union Army during the Civil War. After leaving the House, he resumed his military duty as a Brigadier General in the U.S. Army. On this date, Representative Lovell H. Rousseau of Kentucky assaulted Josiah B. Grinnell of Iowa in the East Front House portico, retaliating for derogatory personal remarks Grinnell made several days earlier in debate. Newspapers reported that while his armed supporters stood watch, Rousseau repeatedly struck the unarmed Iowan with an iron-tipped cane on the head and face until the cane broke. Grinnell emerged bruised but otherwise uninjured. The pair had sparred verbally for several months, but on June 11 the quarrel spilled out into full view on the House Floor when Grinnell challenged Rousseau’s Civil War record. In particular, Grinnell blasted the former Union general’s assertion to have commanded Iowan regiments under enemy fire as “the merest mockery; it is the merest trickery, the merest blowing of his own horn.” Ruling from the chair, Speaker Schuyler Colfax of Indiana sustained Massachusetts Representative Nathaniel Banks’s point of order that the exchange was unduly personal. Nevertheless, the jousting continued and filled another page in the Congressional Globe. A special committee appointed to investigate the assault, recommended that both men be reprimanded—Grinnell for his “wanton and unjust imputations” and Rousseau for an “inexcusable breach of the privileges of this House.” But when the matter came before the whole House on July 17, Grinnell was cleared. The House, however, while rejecting a measure to expel Rousseau, instead voted to censure him—making him one of less than two dozen Members in history to be so punished. The Speaker formally censured Rousseau on July 21, and the Kentuckian resigned his seat in protest later that day. In a show of support, constituents from his Louisville-centered district overwhelmingly re-elected him in the special election to fill his own vacancy. Both men left Congress at the conclusion of the 39th Congress in March 1867.